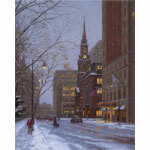 Arlington Street Snowfall from an oil painting by N. Samuel Vokey, private collection. Cards are 7" x 5" and come in a box of 10 cards with envelopes. Inside message: Wishing you all the joys of the Holiday Season.